Comedian Hannah Gadsby at the Emmy Awards. 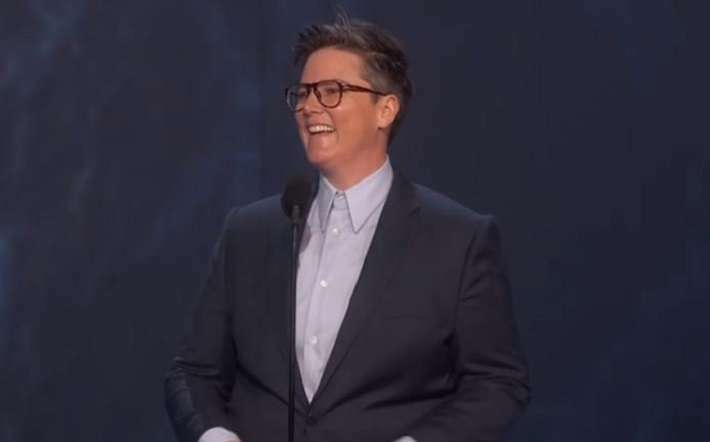 Australian comedian Hannah Gadsby has stolen the show at the 2018 Emmy Awards. Gadsby is still riding the wave of the worldwide success of her acclaimed Netflix special Nanette, which covers Gadsby’s experiences as a queer woman, homophobia, trauma, sexual violence, mental illness and more. And she took to the stage to present the Emmy for Outstanding Director for a Drama Series, during which she delivered several jokes savaging her harshest critics. “Here’s a surprise. This is not normal. The world’s gone a bit crazy,” she started. “For somebody like me, a nobody from nowhere, to get this sweet gig, free suit, new boots, just because I don’t like men. “That’s a joke, of course. Just jokes fellas calm down. #notallmen… but a lot of them. Gadsby went on to present the award to Stephen Daldry from drama series The Crown, who couldn’t accept the Emmy in person. “Stephen could not be here tonight to accept the Emmy on… his own behalf. SO I think I just leave now, and that’s… well done him,” Gadsby said before awkwardly leaving the stage. Gadsby was catapulted to global fame after a recording of her acclaimed stand-up show, Nanette, was released to Netflix earlier this year. How about Hannah Gadsby for #Emmys 2019 host? If we make it through 2018, I think we deserve it.